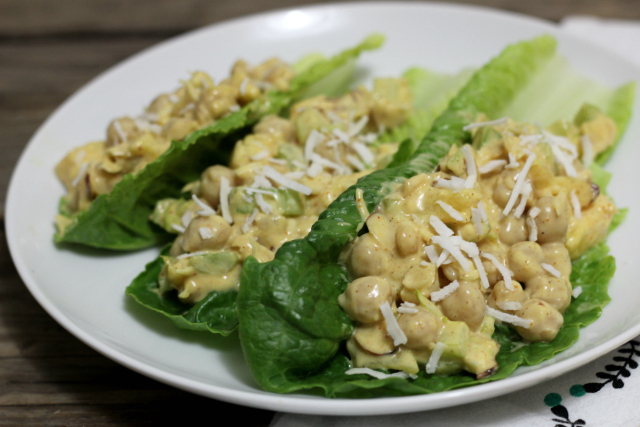 Perfect for summertime meals, Curry Chickpea Salad comes together in just a few minutes. Make it into a sandwich, serve it as lettuce wraps or atop a bed of greens. Picnic perfect (no eggs or dairy), lunchbox ideal, too! But mostly it’s about summer. Do you avoid the kitchen like I do in the summertime? At dinner time here today, the “feels like” temperature was 102 degrees. No way am I spending an hour in the kitchen cooking dinner, firing up the oven or stirring anything over the stovetop. Nope, it’s got to be something cold that requires no cooking. This Curry Chickpea Salad fits the ticket perfectly. Speaking of salads, I thought you might find it helpful if I left a list of some of my summer favorites here for you. Then you can bookmark this site (does anyone do that anymore or is Pinterest the only game in town?) and come back to it when you need cool meals for hot nights! 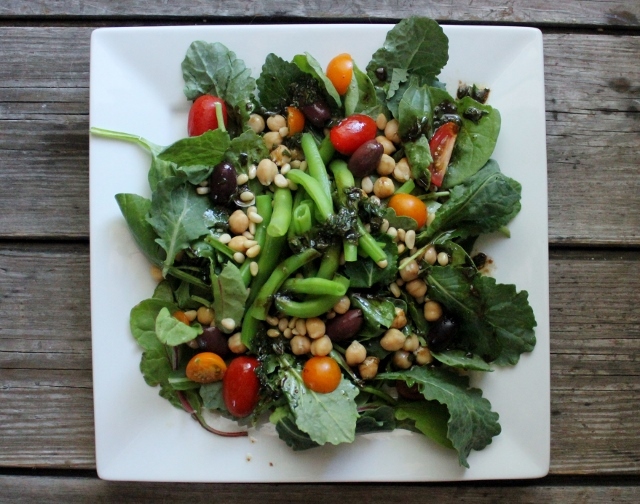 Double Bean Salad This salad requires a quick blanch of garden fresh green beans, but you can easily do that early in the morning or late in the evening when it isn’t as hot. I blanch a whole mess of green beans and keep them in the fridge for a few days to add to salads and Buddha bowls. Brussels Sprout Pecorino Salad (only 4 ingredients!) This was inspired by a dish I had a Eataly in Chicago. 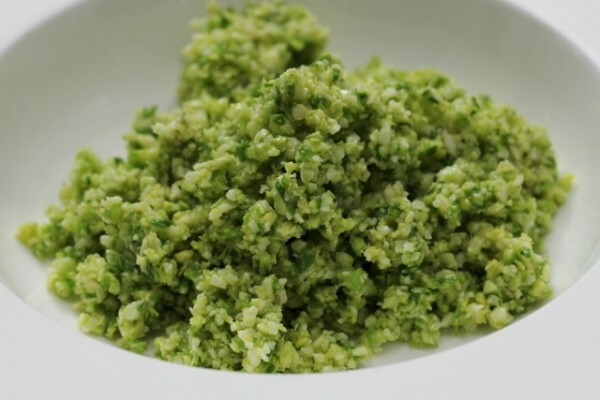 Perfect as a side dish, a starter or a full meal. I like this even better after is has been in the refrigerator for a day. 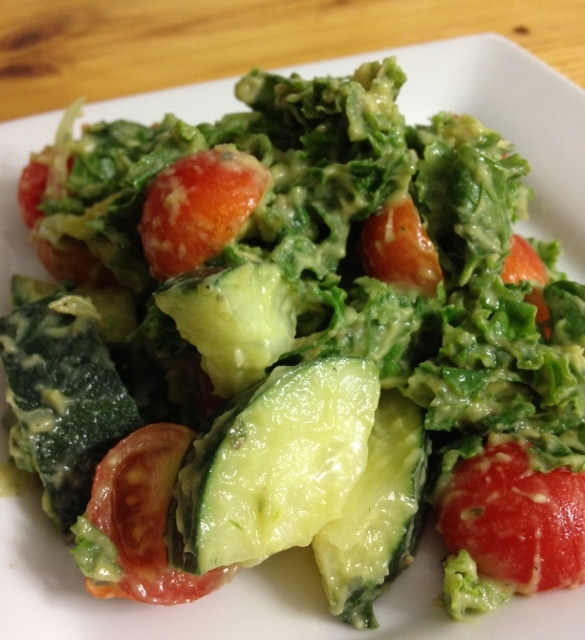 Avocado Kale Salad If you don’t like kale, this could be a game changer for you. No tough, chewy greens here, only tender kale after mixed with the simple ingredients. Oh, and there’s no added oil in the dressing! 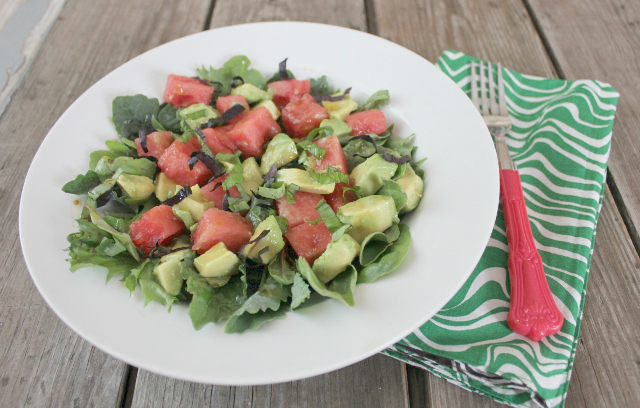 Watermelon Basil Avocado Salad This is my favorite salad on a VERY hot day. Because watermelon and hot days belong together! 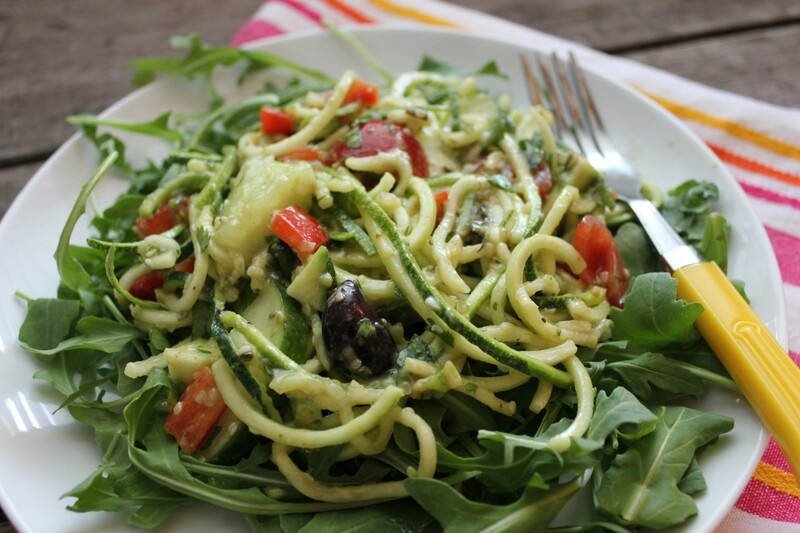 Zucchini Pasta Salad with Avocado Dressing (with spiralized zucchini!) This is what I make instead of pasta salad. So creamy, so light and no gluten-free pasta to get gummy or fall apart. Good stuff for sharing at a potluck, BBQ or picnic! 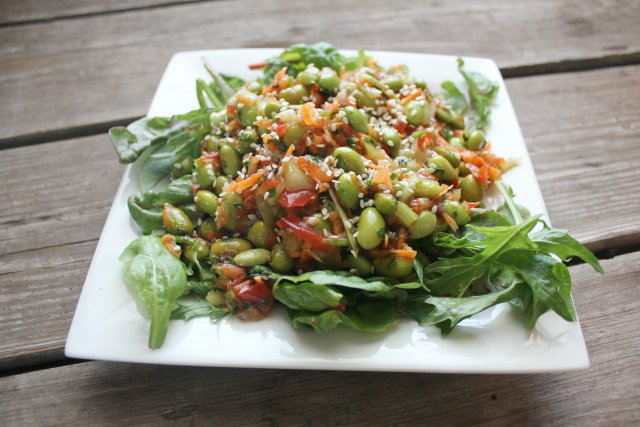 Asian Edamame Salad This salad is protein packed with edamame and has a dressing you’ll want to make for more than just this salad. I love a homemade salad dressing, especially when it is quick and easy to make and tastes better than anything in a bottle at the store. 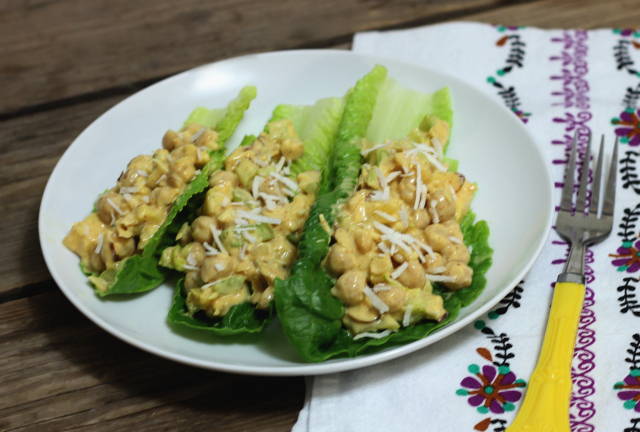 Now that you have a full list of recipes to use this summer, how about the newest one, Curry Chickpea Salad? Here’s the recipe for you. Enjoy! In a large mixing bowl, ussing a fork or potato masher, roughly mash 1/2 of the chickpeas. Then add all ingredients to bowl. Stir to coat and combine ingredients. Refrigerate for 1 to 2 hours before serving. The flavor is better after it has been stirred together for awhile. Serve in romaine heart lettuce "cups" or use butter lettuce similarly. Alternatively, serve over a bed of greens or on gluten-free sandwich bread. This sounds perfect and light and refreshing for the summer heat! Love how healthy it is too! This sounds great and so refreshing for dinner! I love cold dinners in the summer, and this fits the bill! Thank you! I’m also a fan of cold dinners in the summer. I agree, other people’s salads always look better than mine, too. And don’t get me started on eating a salad out, because that is somehow better, too. I love the idea of adding pistachios! I will try that this week. So glad you enjoyed it!